She told her lawyer she had two final requests. First, she said she wanted to be cremated, and second, she wanted her ashes scattered over Bloomingdales. "Bloomingdales!" the lawyer exclaimed, "Why Bloomingdales?" This pie makes its own crust...it can't get any easier than that. And, it's delicious too! Perfect for any get-together. Always a crowd-pleaser. 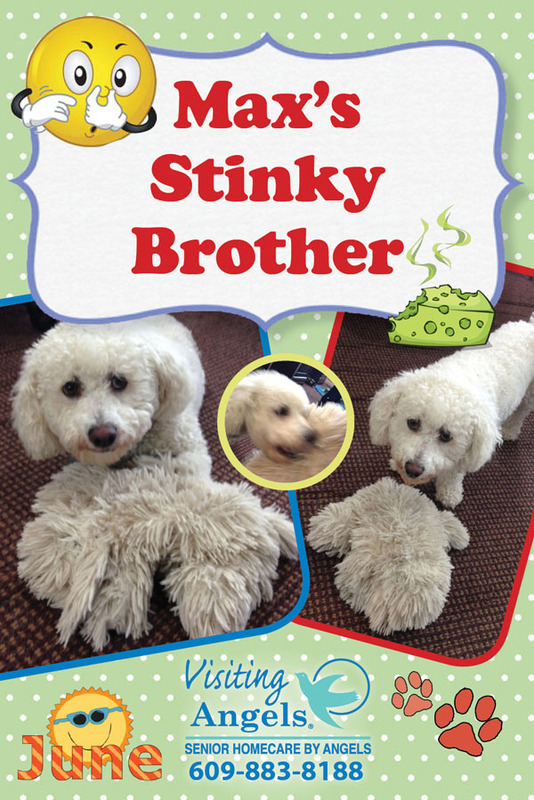 Our office mascot, Max, has a favorite stuffed toy, affectionately known as Max's "stinky brother." Summer will be here soon, and we're all happy about that! Isn't it a pleasure just to sit outside and appreciate nature? We hope you have many opportunities this month to enjoy the warmer weather with friends, family, and loved ones. "Summer afternoon--summer afternoon; to me those have always been the two most beautiful words in the English language." Thanks for reading this issue of "Home Care News by Angels"! We look forward to hearing your comments and suggestions about our newsletter. Please email us at info@njseniorcare.com or post on our Facebook page. JOY FOR ALL Companion Pet cats look, feel and sound like real cats. But they're so much more than soft fur, soothing purrs and pleasant meows. These animals respond to petting, hugging and motion much like the cats you know and love. This two-way give-and-take helps create a personally rich experience that can bring fun, joy and friendship to you and your loved ones. Perfect for those who cannot take care of a pet any longer, but who long for a furry companion. Visit www.joyforall.hasbro.com for additional product details and to watch a video demonstration. This easy-to-use workout board--backed by Shark Tank's Lori Grenier--will help improve your balance and will help tone your core, tightening your abs and legs. Simply place on the floor, stand, and twist. It's lightweight and is easily stored. A workout DVD is included with purchase. Visit www.simplyfitboard.com for more information on this product. "At the beginning, Visiting Angels came to provide transportation for my mother. She was very active going to her gym, shopping or doctor's appointments. Gradually, as the years went on (5 years in total), Visiting Angels was here more and took on more responsibilities such as laundry, light housekeeping, and grocery shopping. They were here every day, every afternoon. Unfortunately, in the last 6 months of her life, my mother had a couple of falls in the house. From that point, we had live-in service. They provided really wonderful care for my mom from the very beginning right up to the end of her life. Her every need was met. Visiting Angels truly was a lifesaver. I can't imagine what we would have done without them." Travel back in time with us for a quick peek into the 1930s. History, new products, what things cost, fashion trends, and pop culture. Marie M. and Ladie A. are assigned to the same client. Both Angels are eager to fill-in or adjust their work schedules in order to accommodate any schedule tweaks they or our client may request. This helps ensure our client receives continuity of care, and doesn't need to adjust to a new Angel each time one of them is unavailable. We truly appreciate this team's flexibility and cooperation! Each month, Rudy Tervooren (Co-Owner and Executive Director) travels throughout the community visiting referral sources and attending client meetings. If you would like to schedule an elder care presentation, please call 609-883-8188 or email info@seniorcare.com. This month's Community Resource Bulletin focuses on NATIONAL SAFETY MONTH. To download a printable copy of our current month's bulletin, click here. You will also find back issues of our Community Resource Bulletin from previous months on our website's resource page.